The Little Free Library movement came about in 2009 when Todd Bol of Hudson, Wisconsin built a model of a one-room schoolhouse, filled it with books, and installed it on his front lawn as a tribute to his mother, a beloved reader, neighbor, and after-school tutor. When neighbors and friends began asking Bol to build little libraries for them to install, a global movement was born. 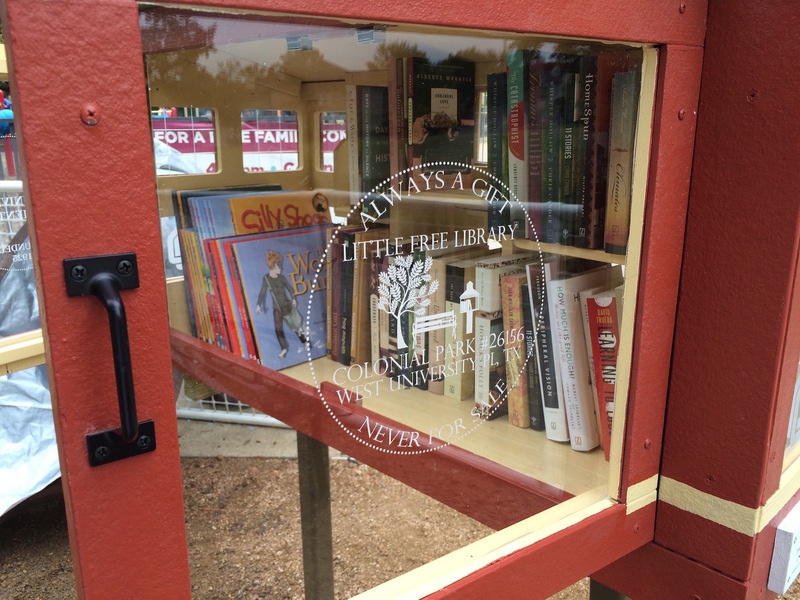 Today, approximately 30,000 little libraries have been established and more than 40 million books have been exchanged. And six new ones are coming to West University Place—each designed to look like a neighborhood landmark. When I approached the city with a bid to establish a single library, the Parks and Recreation Department was so enthusiastic that together we created a plan for a library in each of West University’s six parks. The first, which was unveiled at the end of October, was modeled after West University Elementary School in honor of its 90th anniversary, and built by local builder, Fortitude Studios. Roger Martin Properties sponsored the project, which covered the cost of building and installation. 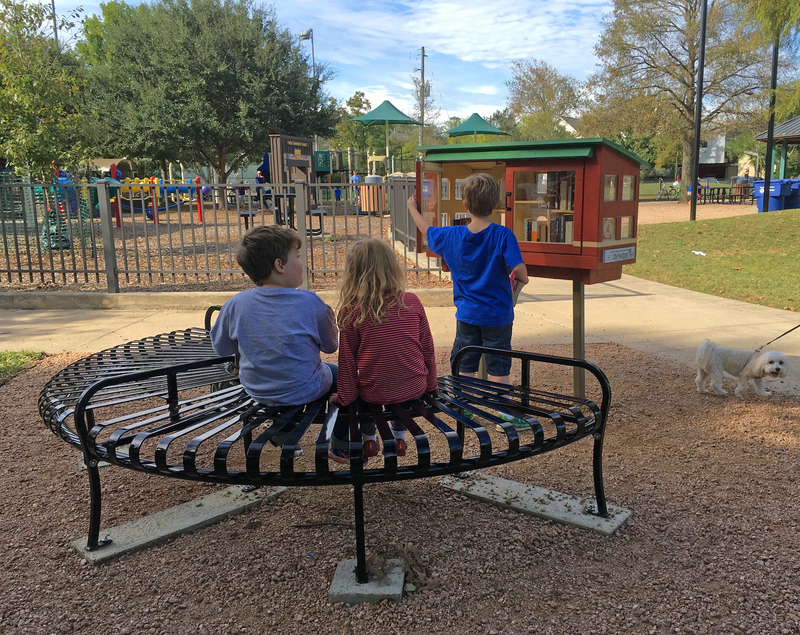 We cleared a large space and placed the free-standing structure and a new curved bench in a high-traffic area, and stocked it with new books from two of my publishers: Bright Sky Press donated children’s titles, and Other Press donated novels for adults. It’s enough to make even the most reluctant reader want to curl up with a good book. When I approached the city with a bid to establish a single library, the Parks and Recreation Department was so enthusiastic that together we created a plan for a library in each of West University’s six parks. As steward, I visit the library every few days to make sure it’s neat and well-stocked. I haven’t been once when someone wasn’t perusing, stocking, or reading. Last week, I went by and noticed two children aged five or six sitting on the bench with an Anne Rice novel open across their laps. “Hey!” one of them said to me. “Did you know you can get free books here?” He pointed to the library with his lollipop. Decide where you can safely and legally install your library. Like any real estate, it’s all about location, location, location: choose a spot with high visibility and pedestrian traffic. You’ll also need to apply for a building permit, even if you want to install your library on private property. Visit houstonpermittingcenter.org or email rmcacd@houstontx.govfor more zoning and permitting information. Buy or build a library. You can build your own, hire a builder like I did, or purchase one from the Little Free Library online catalog. You can also find custom and handmade libraries on artisan sites like Etsy.com. Get a charter number. 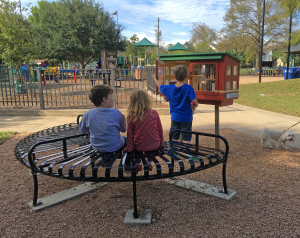 Unless you buy your structure from littlefreelibrary.org, you’ll need to register your library to become part of the worldwide LFL network. In addition to an official sign with your unique charter number, you’ll receive a steward’s guide, the option to add your library to the world map, access to new, discounted books, and a subscription to the regular newsletter. Launch your library. Once you have installed your library, plan a celebratory unveiling to build awareness, enthusiasm, and community support. Tell your friends, family, and neighbors; send out a press release to local papers and TV stations; use social media to let people know about your grand opening. Sustain support. The average Little Free Library goes through between 20 and 100 books or more per month. The inventory is driven by community participation, so encourage friends and neighbors to become champions of the library by visiting, checking, re-stocking, and enjoying. Visit the Little Free Library website to learn more.